We had planned and publicized October's Ride for weeks. We were excited to wear our costumes while riding and two of the boys' costumes actually involved bike helmets (even though they were not bicycled-themed). 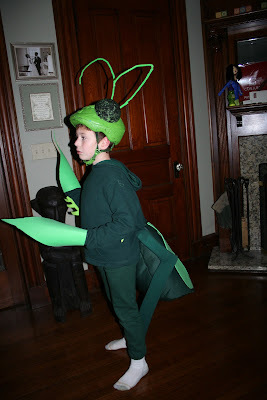 Praying Mantis-- C was pleased when he realized that its head was shaped a bit like a bike helmet. Good thing we are a nutty family who happens to have uh... an extra bike helmet in the garage to spay paint and affix large eyes. 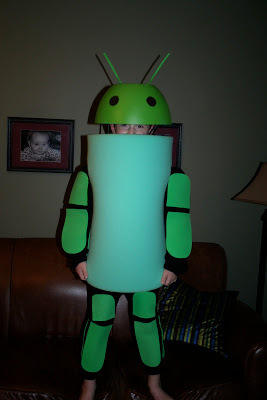 S was an android. That's a salad bowl on his head but to keep it up, we cut out a circular piece of foam and then taped a Nutcase helmet inside of it. And then came the snow. And the power outages throughout the state. We had been holding out hope that somehow the freak early storm would not dampen our Kidical Mass dreams, but at 8am that morning, we had to call it. 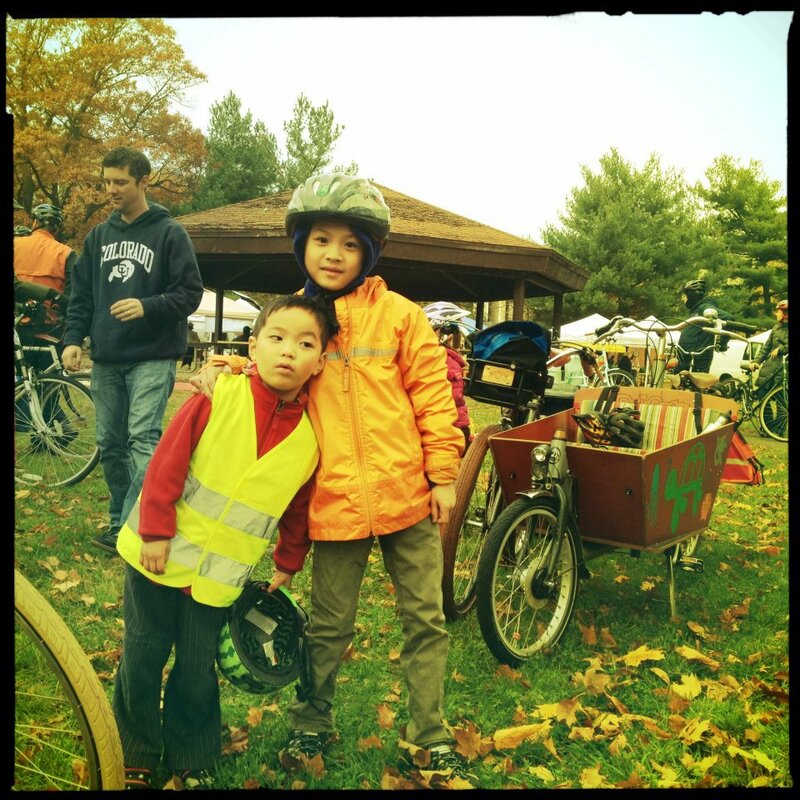 While we usually are always willing to go for a bike ride, snow or no snow, we recognized that for our area, Kidical Mass is about trying to attract all different families to ride together, even those who are less zealous about it than we. We thought it best for the kick-off ride to be on a non-snow day (shout-out, of course, to Chicago's Kidical Mass that rides year round). We still rode over to the Farmer's Market and hang out just in case folks did not get the news about the KMNH October ride cancellation. We were lucky that we only lost phone and internet for a couple of days. Some people in the state were without power for 11 days. This looks like an ad for Bogs boots to me. Yup, we each have a pair. On the up side, we did still get to participate in the Giant Puppet Parade a few hours later. Recognizing the importance of getting a group ride in before the real winter started, we sent a quick poll to some committed local family bicyclists and it seemed that November 13 suited most. Without weeks and weeks to publicize the new event, we got word out best we could. With little idea just how well it would be attended, I was feeling a bit stressed and tried to squash the "I forgot to study for the exam" dreams that kept awakening me for numerous nights. We took advantage of a day off from school to ride and time the route ourselves. Come Sunday morning, while the sky appeared clear, might I admit to some less-than-stellar parenting moments as I tried to get the boys dressed and out for the ride early? Thankfully, my husband was still speaking to me as we saddled up and pedaled off to the meeting place. We rode up to find one dad and toddler waiting. My boys greeted them enthusiastically and introductions were made. Over the next 20 minutes or so, 50 more participants arrived. That's right! Much to my extreme gratitude, we had over 50 riders for our hastily-rearranged inaugural KMNH ride. We had bicyclists, bikes, and wheels of all sizes. There was a nice array of kid-carrying velos from kid seats, cargo bikes, and trailers. We enjoyed the route that had us ride on a paved park path, a few urban streets, and one lovely residential one. We ended up back in Edgewood Park, many of us indulging in the most incredible almond croissants from SoNo sold at the Farmer's Market, and looking forward to our next KMNH Ride. Our friends just purchased this Madsen from our local bike shop but are waiting on their bucket. 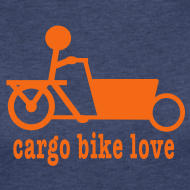 Isn't it great that they ordered Madsen Cargo Bike Love t-shirts??? Here we are waiting for the next group to get through the green light. Thanks to V. Balbarin for these last two snaps. 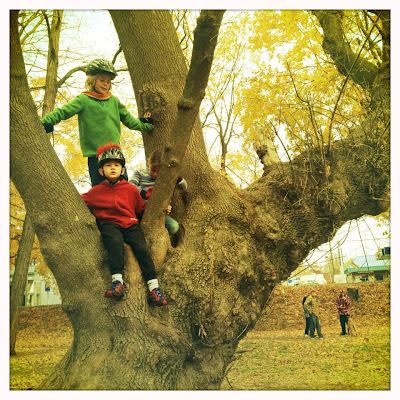 No, we do not make our kids wear helmets when climbing trees. It just happened to be a favored activity after the ride before helmets were shed. 50 people?!! What a great turnout! Sounds like it was a really fun ride. We have to come out to New Haven and ride with you guys sometime. ;-) And I'm doubly jealous now as we couldn't make the Chicago November Kidical Mass ride this past weekend - boo! Great photos too! Looks fabulous! I would have been there in the snow with you :) And I was having the exact same freaky stressed out moments too. My husband knew to just give me distance and afterwards it would be ok. Was this your first ever? Does this make two brand new KMs in one weekend? Oh my! WTG Sara!!! That's incredible! So glad to hear you had the Kidical Mass after all -- parenting and biking is all about having a plan b, isn't it. Thanks for sharing your inspiring pictures! Hooray for your inaugural ride! (I'm just going to be sending those helmets in the trees pics off to Copenhagenize..... just kidding! ) This looks like the very fun first of many, many to come. Congratulations! !